There are lots of fun and unique products to buy for yourself or bring home as gifts to friends and family from Chicago. Souvenirs are one of the best ways to tell your friends and family that you are thinking about them while traveling. And it’s also something that’s fun to buy for yourself as a memory from your trip. So, do you want to know what Chicago gifts to buy? Then continue reading below, because here’s a list of the top 10 things to buy in Chicago! One of the most popular Chicago souvenirs to buy during Christmas time is a Chicago-themed Christmas ornament. The most classic would be to buy a Christmas ornament that looks like the famous Chicago Bean. Buying Christmas ornaments as souvenirs are always fun since when you’ll look at your Christmas tree, you’ll be reminded of all the cool places you’ve visited! 2. Garrett Popcorn – One of the yummiest Chicago gifts! While strolling around Chicago, you’ll know right away when you’re near a Garrett Popcorn shop since you’ll feel the smell of cheese and caramel, + you’ll probably see a long link snaked around the block since it’s so popular. 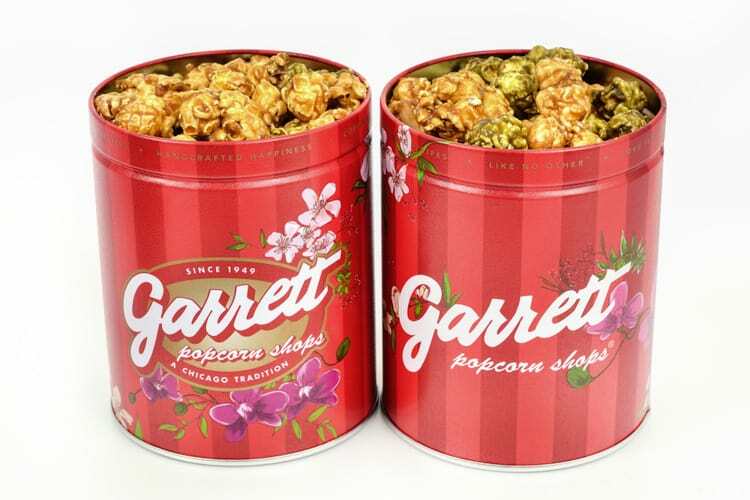 Garrett Popcorn is a must if you’re looking for some yummy Chicago gifts! My recommendation is to try the Sweet-and-Salty Chicago Mix, which is a combination of caramel and cheddar cheese flavored popcorn. If you’re interested in art I can recommend buying a vintage Chicago-themed poster. You can buy a limited edition poster for around 80 USD, and a custom framed poster costs around 230 USD. Poster Plus has a wide range of Chicago posters, both original vintage, and collectible posters. The shop is located on 30 E. Adams St, just a block from the Art Institute. Poster Plus is open from Tuesday to Saturday 10 am – 6 pm. 4. Tiffany Elsa Peretti Bean Collection – One of the most beautiful Chicago souvenirs! In the center of Millennium Park, you’ll find the Cloud Gate, also known as ”the bean”. It’s one of the most famous spots in the city, which makes this souvenir very special. At Tiffany & Co you can buy a miniature bean and wear around your neck. It’s in collaboration with Elsa Peretti that they’ve created this 9-millimeter sterling silver bean pendant. The necklace costs 100 USD and will make a perfect souvenir that will remind you of your trip to Chicago every time you wear it. The bean necklace from Tiffany & Co. is definitely one of the prettiest Chicago souvenirs you can buy in the city! In the Chicago area they harvest lots of honey, and from the honey they make mead. Mead is created by fermenting honey, which is one of the oldest methods of making alcoholic beverages. The production of mead started 8000 years ago. Wild Blossom Meadery & Winery produces award-winning mead that’s a must to taste and buy while visiting Chicago. Just like wine, mead comes in dry and fruity varieties. They sell both pomegranate, blueberry, and apple cinnamon mead – there are so many flavors to choose from! They also sell a delicious green apple Riesling if you don’t fancy mead that much. A bottle of mead starts at around 15 USD, and are available for purchase at several wine retailers around the city. You can get it at Fox and Obel Market, and also at Binny’s Beverage Depot. 6. LEGO Willis Tower – One of the most popular Chicago souvenirs for kids! If you’re planning to buy a souvenir for a child, then I can recommend buying a LEGO Willis Tower kit. The Willis Tower (also known as Sears Tower) was the tallest building in the world when it was completed 1973, and is still today the tallest building in the US. This is a fun souvenir for the kids who like to play with LEGO since they can build up a miniature version of the Chicago Willis Tower. If you’re looking for a shop with a variety of Chicago souvenirs, then Foursided is the place to go! The first shop was opened in 2001 in Lake view, and now there are three North Side locations where you can buy these Chicago gifts. Here you can shop both greeting cards, skyline necklaces, posters, and prints of iconic buildings and locations in Chicago. 8. Cubs Team Store – Best Chicago gifts for the sports fans! If you’re a fan of baseball, then you simply have to go to one of Cubs games while you’re in Chicago. 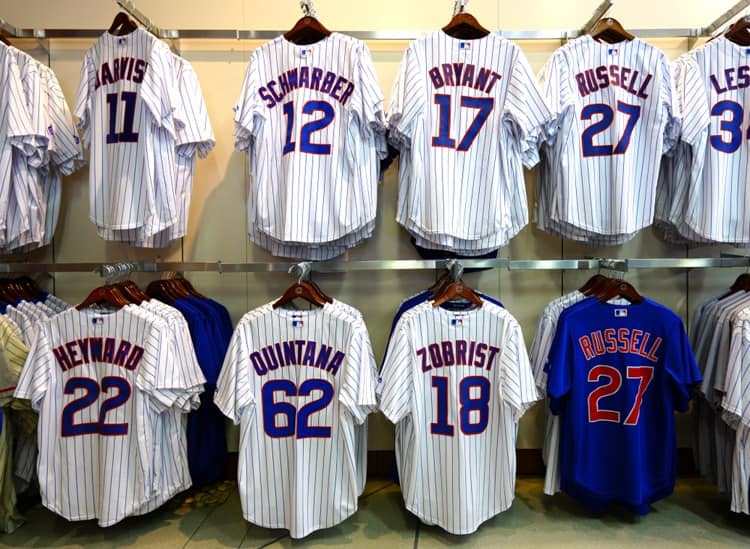 Before the game, make sure the visit the Cubs Team Store and buy yourself a jersey or a baseball hat. This will not only be fun to wear at the game to blend in will all the supporters, but it will also be a fun souvenir to bring back home. This is no doubt one of the best Chicago souvenirs for the sports fans! If you want to bring some Chicago flavors with you back home, then I can recommend buying a Spice House spice blend gift box. Each box includes their Old World Central Street Seasoning, Old Taylor Street Cheese Sprinkle, Lake Shore Drive Seasoning, and Bronzville Rib Rub. If you’re looking for some beautiful, unique and local ceramics, then you have to check out Up in The Air Somewhere’s website. The Chicago-based artists Susan created beautiful handmade ceramics and papier-mache goods with beautiful gold patterns. I don’t know if there’s a store in Chicago where you can buy these or not. But you can buy these Chicago souvenirs online. Go visit their website for more information.